Manila, Philippines 8 June 2017 - SRSG Santos Pais highlights importance of cross-regional cooperation to prevent and eliminate violence against children at Seventh Cross-Regional Round Table. 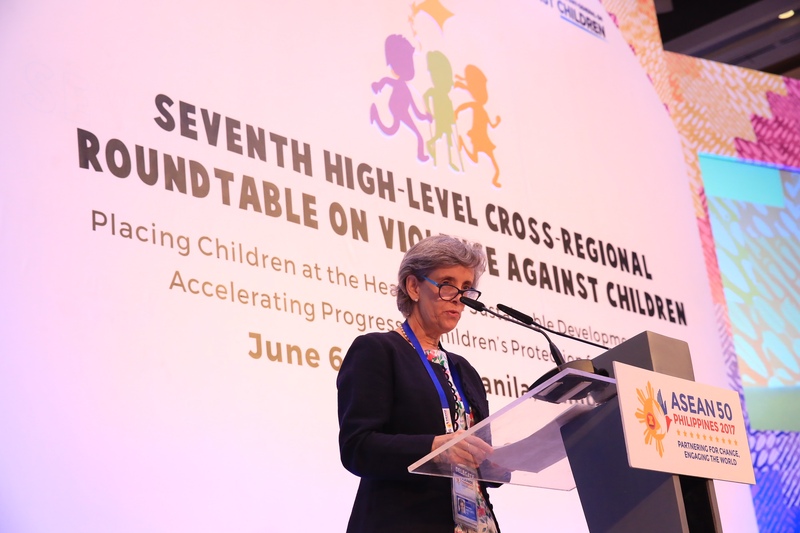 The Seventh Cross-Regional Round Table on the Prevention and Elimination of Violence against Children was hosted by the SRSG and the Association of South East Asia Nations (ASEAN), during its 50th anniversary under the chairmanship of the Philippines, from 6-8 June, in Manila. It included high-level participation by representatives from regional organizations and institutions from across the world and focussed on investing in children and accelerating progress in their protection from violence as a key dimension of implementation of the 2030 Sustainable Development Agenda. "The Cross-Regional Round Table is a strategic UN-based platform established to support dialogue and cooperation between regional organizations and institutions on children’s concerns generally, and on violence against children in particular. Through enhanced action across regions we can help build the world that children themselves wish to see: a world free from fear and from violence! This is the vision of the 2030 Agenda for Sustainable Development, which has created an unmissable opportunity to build momentum, galvanize political will and generate wide social support for children’s protection” stressed Santos Pais in her opening statement to the Round Table. The Round Table highlighted the value of social inclusion and social protection measures and the promotion of cross-sectoral and integrated services to prevent and respond to violence while keeping special attention on those left furthest behind. The cross regional meeting was held alongside an ASEAN children’s forum which also focused on the key themes of protection of children from bullying and online abuse, and the empowerment and participation of children to prevent and address incidents of violence. Young people from ASEAN Member States and the Republic of Korea stressed the importance of having a loving and supportive environment at home, within schools and in the community. They called for awareness raising and information sharing initiatives to become empowered citizens, identify risks, report incidents and seek help from child sensitive services. They recognized the need for urgent government action, including laws, policies and budgets, as well as good parenting initiatives and capacity building programmes for professionals working with children. They also want genuine opportunities and platforms for open discussions with young people. “Everyone has a role and if we are willing to step up and end violence against children, then we can make the world a better place”, they declared in their recommendations. At the conclusion of the Round Table, participants agreed to use the strategic opportunity provided by the UN High Level Political Forum (HLPF) in July 2017 and the development of voluntary national reviews to accelerate progress towards the elimination of violence against children as foreseen by SDG target 16.2. This year the HLPF focuses on the eradication of poverty and promotion of a protective environment for children to overcome deprivation, social exclusion, gender discrimination and other vulnerabilities which compromise children’s well-being. Recognizing that half of those living in extreme poverty are children and that deprivation exposes them to a high risk of violence, representatives from regional organizations reaffirmed the right of the child to grow up in a nurturing non-violent family environment and to access universal, inclusive and child-sensitive basic social services of quality. They called for integrated approaches and cross-sectoral cooperation guided by the best interests of the child, such as One-stop Centers, to address the multifaceted nature of deprivation and violence against children, and to provide effective family support and child protection services. They also recognized the urgency of investing in violence prevention, including through early childhood and good parenting programmes and through enhanced mobilization of national resources, as well as ODA to support initiatives to prevent and respond to violence against children with priority being given to the most disadvantaged children. In this connection, they called for the protection of the rights of refugee and migrant children, including from all forms of violence and from the risk of deprivation of liberty. In her closing remarks to the Round Table, the SRSG stressed the special role of regional institutions in advancing progress in the implementation of Agenda 2030. “Ensuring that our pledges are translated into action at the national level is crucial to accelerating progress towards the Sustainable Development Goals and reaching target 16.2 to end all forms of violence against children. Enriched by the diversity of regional experiences and policy developments, we stand united in our unshakeable commitment to promote positive change towards a world free from fear and from violence, keeping children at the heart of our efforts”.